Hair loss is no laughing matter, so why do a lot of people insist on taking it lightly? By now, you’ve probably gone through a whole lot of treatments and solutions, all touting themselves to be that one true “miracle” cure. Here’s the secret, though: none of these magic concoctions can treat hair loss unless they contain ingredients that actually work … for you. Take biotin shampoo for hair growth, for example. As the most popular vitamin for hair, skin, and nail health, biotin is always an excellent addition to any hair loss solution. Using a biotin hair growth shampoo is the easiest way to bring the benefits straight to the roots regularly. If you’re looking to step it up and try biotin shampoo for hair growth, this post has got you covered. 1 What is biotin and what can it do for you? 5 Biotin shampoo for hair loss – How long to see results? 6 What foods are rich in biotin? What is biotin and what can it do for you? Biotin is one of the most popular ingredients for combating hair loss — and for good reason! This water-soluble vitamin B complex is key to energy conversion — biotin converts the food you eat into usable energy that feeds cell growth. The body can’t produce biotin on its own, but it is widely available in a variety of food items like egg yolks, nuts, legumes, mushrooms, milk, avocados, animal organs, cauliflower, and more. Biotin deficiency isn’t likely as long as you consume a well-balanced diet, but it does happen. Women, for example, can experience some mild form of biotin deficiency while pregnant. Negative symptoms of deficiency aside, it is equally important to highlight the benefits that biotin can provide. Biotin also suppresses inflammation and strengthens the body’s immune system. Though it’s officially known as B7 (since it is part of the B group of vitamins), a popular nickname for biotin is “vitamin H”. Skin cells need healthy fats to fight off environmental damage and dehydration. Because biotin plays a key role in synthesizing fat, it becomes a key factor in maintaining skin health. All these benefits are excellent and definitely necessary for overall health, but what exactly can biotin do for hair growth? Insufficient biotin levels in the body can significantly lead to weaker, damaged hair. Split ends, breakage, fragility, and brittleness — these are just some of the negative effects of biotin insufficiency on the hair. Without biotin, the hair becomes thinner and more prone to hair fall over time. Biotin promotes hair growth, thanks to its key role in cellular development. With this B vitamin, hair follicles are properly nourished with the right nutrients, leading to greater hair volume and thicker hair. Apart from its central role in hair regrowth, biotin also strengthens hair strands and repairs hair damage. With biotin, you can stop excessive hair fall as it prevents hair breakage and fragility. Hair strands can grow to their absolute full potential without falling prey to environmental stressors. Biotin also keeps the scalp healthy, thanks to its natural ability to stimulate sebum production. Dry scalps get flaky, and these skin flakes can easily clog up the hair follicles, leading to hair loss. With biotin, the scalp is properly lubricated — no more dry flakes to worry about and hair can grow without worries. Finally, studies have also shown that biotin can be used to treat hair disorders like alopecia. What more can anyone ask for? Biotin shampoo clearly is a serious contender when it comes to addressing hair loss and promoting hair growth. The good news is that biotin is now a key ingredient in a large number of hair growth shampoos, making it easily accessible. But of course, the sheer number of choices can lead to confusion. How exactly do you choose the right biotin shampoo for hair growth? The first step is always to read the ingredients list. You want to avoid harsh ingredients like sulfates, dyes, and parabens as these can make damage worse and increase hair fall. Instead, you want ingredients that can strengthen the hair and boost the positive effects of biotin. Look out for ingredients like coconut oil and aloe vera — these are natural moisturizers that nourish the hair and scalp. Caffeine is an excellent addition, too, as it is a known DHT-blocker that helps block the effects of androgenetic alopecia. The second step is to look into customer reviews. Honest feedback is a great way to make sure that the shampoo actually has tangible results in battling hair loss. 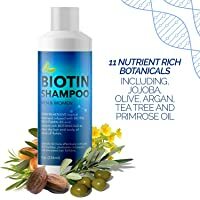 Brands will obviously play up the positive features of their biotin hair growth shampoos, but customers can give you real and useful information about the product. Next, don’t forget to check the return policy of the company. Since it is great sign showing company’s guarantee for their product quality. Finally, don’t let the price distract you. The best shampoos for hair growth require extensive research and top-notch ingredients, so these can cost a pretty penny. Remember to prioritize quality over affordability, as the cheaper option isn’t always the smarter choice. But actually, there are cheap products that really work well. Keep on to check out! Next part will show you our top 5 best biotin shampoo for thinning hair that we have picked from hundreds out there. So … don’t miss the soul of this article. Congratulation! You have made it 30% of the article. Keep going! 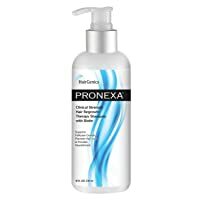 Though on the pricier side, Hairgenics Pronexa boasts of a number of key ingredients for combatting hair loss. Pronexa contains saw palmetto — a natural DHT-blocker. See, male pattern hair loss or androgenetic alopecia is due to a genetic over-sensitivity to dihydrotestosterone (DHT). Saw palmetto blocks an enzyme called 5-alpha-reductase, which converts testosterone into DHT. With this extract, Pronexa is able to halt pattern hair loss and prevent the hairline from receding any further. Aside from saw palmetto, Hairgenics Pronexa also has aloe vera extract — a known ingredient for stimulating hair regrowth. Aloe vera treats and moisturizes the scalp, preventing dryness and flaking. A healthy scalp environment means the follicles are free from blockage and can promote hair growth. Another notable ingredient in Pronexa is seaweed extract. It may not be as well-known in the West, but seaweed has long been a health food in Asia. What makes seaweed great for hair regrowth is that it contains a host of key nutrients and minerals such as zinc and iron to prevent excessive hair fall. Seaweed also contains vitamins A, B, C, and E for healthier and thicker hair. The lack of sulfates in Pronexa has made it a bit challenging to use, as a lot of product is required to feel fully cleansed. This biotin hair growth shampoo from Hairgenics also takes some time to show any noticeable results, which can be frustrating for customers. And stop using product might bring back hair fall. Hairgenics recommends 6 months of regular use to see an improvement in hair growth. Biotin nourishes scalp and hair for increased thickness and volume. Natural conditioner aloe vera helps soften hair. Saw palmetto stops hair loss from progressing. Treats scalp dryness and irritation. Can work for both men and women. Offers a 31-day return policy. More expensive than other hair growth shampoos. Small bottle for its price. Some users can be allergic to the ingredients in the shampoo. Takes a lot of product to lather. The claim to fame for Honeydew’s Biotin Shampoo is its all natural approach to addressing hair loss. With 11 natural extracts in its ingredients list, this biotin shampoo offers thicker and fuller hair without any harmful ingredients. In fact, the shampoo is officially certified non-GMO and hypoallergenic. Coconut oil, evening primrose oil, and argan oil serve as lush moisturizers to nourish the scalp and strengthen the hair strands. Zinc and tea tree work together as anti-inflammatory agents, fighting against possible scalp infections and dandruff. Another star ingredient to consider is rosemary extract, which promotes hair growth by stimulating blood circulation. It is also a known analgesic, making it an excellent option for fighting scalp inflammation and dryness. Honeydew Biotin Shampoo also has provitamin B5 that makes hair thicker and shinier with regular use. Altogether, this natural blend of extracts delivers the necessary nutrients for healthier hair follicles and stronger hair strands. Customers found the shampoo highly nourishing, but the richness of the essential oils in the ingredients list can leave the hair too greasy or oily. Since this biotin shampoo contains no sulfates, it hardly lathers and it can be a struggle to feel fully cleansed after washing. The presence of natural extracts can also increase the chances of allergies and sensitivity, leading to scalp irritation and breakouts. Water, Sodium Cocoyl Isethionate, Cocamidopropyl Betaine, Sodium Lauroamphoacetate, Sodium Methyl Cocoyl Taurate, Sodium Lauryl Glucoside Carboxylate, Lauryl Glucoside, Sodium Cocoyl Glutamate, Acrylates Copolymer, Coco-Glucoside, Glyceryl Oleate, Caprylhdroxamic Acid, Glyceryl Caprylate, Zinc Pyrithione, Glycerin, Sodium PCA, D-Panthenol, Biotin, Phytokeratin, Jojoba Oil, Tea Tree Oil, Coconut Oil, Olive Oil, Evening Primrose Oil, Argan Oil, Fragrance. You won’t find any harsh ingredients in this Paisle Botanics Reline Biotin Shampoo. The shampoo was formulated without parabens, sulfates, formaldehyde, lye, or phosphates. It’s also certified non-GMO and hypoallergenic. The focus for Paisle Botanics Reline is “healing” — the use of nourishing and moisturizing ingredients to restore scalp health and encourage hair growth. There’s aloe vera extract and coconut oil to keep the scalp well moisturized and free from dandruff flakes. The flakes can clog up follicles and prevent the hair strands from growing to their full potential. Saw palmetto and rosemary oil are excellent additions in the battle against DHT. For those suffering from androgenetic alopecia (pattern hair loss), these ingredients are crucial if you want to halt the hair fall. Paisle Botanics Reline Biotin Shampoo is also rich in vitamin E for thicker and shinier hair. Because of the gentle ingredients, this biotin shampoo is safe to use with color-treated – even bleached – and chemically damaged hair. As with other sulfate-free products, this shampoo from Paisle Botanics Reline won’t lather easily or at all. This can be challenging for people used to lots of suds when washing hair. The presence of natural extracts can also be a little too much for sensitive skin and trigger allergies. 100% natural hypoallergenic hair growth shampoo formula contains no harsh chemicals and is Paraben free, Sulfate free, SLS and Sodium Chloride free. Infused with botanical Biotin + Rosemary Oil – Aloe Vera + Coconut Oil + Saw Palmetto + Hemp seed oil + Vitamin E & Protein – 100% Color Safe Thickening Shampoo. Cleanses hair gently and efficiently. Biotin strengthens hair and encourages hair growth. Has rosemary oil which is as effective as minoxidil. Saw palmetto blocks DHT and combats hair loss. Gives hair a fuller body. Botanical extracts moisturize and nourish both hair and scalp. Free from harsh chemicals like lye, formaldehyde, sulfates, and parabens. Can leave a soapy residue on hair. Some users can be allergic to the extracts. Does not really lather well. For Nourish Beaute, restoring hair health relies on a combination of science and nature. The key ingredient here isn’t biotin, but a patented DHT-blocker developed in Europe called procapil. According to Nourish Beaute, clinical studies have shown that procapil can stimulate hair growth by a shocking 121%! Procapil can also reduce hair loss by 46% and prolongs the growth phase of the natural hair growth cycle. Extending the growth phase gives hair more time to reach its full potential. Apart from their unique ingredient, Nourish Beaute also has coconut oil extracts and castor oil to stimulate hair growth and strengthen the strands. By preventing hair breakage and fragility, hair can grow to its full potential. A natural moisturizer, coconut oil increases shine and luster. It also eliminates frizz and makes hair a lot more manageable. Nourish Beaute shampoo gives hair more volume and a fuller body. The rich ingredients can be a double-edged sword, though. Some customers may find the shampoo a bit greasy and the oils in the blend can cause acne breakouts, especially near the hairline. People with sensitive skin may want to watch out — the shampoo can leave skin dry, especially behind the ears and on the nape. The combination of biotin and collagen is amazing for restoring vitality to thin and weak hair. Collagen — as well as the hydrolyzed what proteins in the ingredients list — can push life back into fragile hair strands. These ingredients can plump up each strand, so hair is more voluminous with just one wash. But Organix doesn’t just make hair “look” thicker. Biotin in this shampoo ensures that hair is stronger and less prone to breakage. Nutrients are delivered straight to the hair follicles and the strands are able to reach their full growth potential. 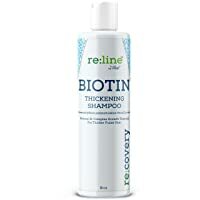 The result: stronger, longer, and thicker hair with regular use of this biotin shampoo. 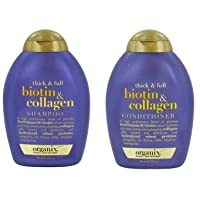 According to the brand, Organix Biotin and Collagen Shampoo yields best results when used in conjunction with its partner conditioner. The combination of shampoo and conditioner makes hair softer and shinier. It’s worth noting that Organix doesn’t contain any DHT-blocking ingredients, so it works better for hair loss caused by telogen effluvium rather than androgenetic alopecia. 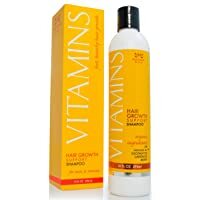 Some customers also noticed an increase in hair frizziness and flyaways after using this biotin shampoo. Others found the shampoo quite heavy and greasy, especially on thin and limp hair. Organix does not offer a money-back guarantee for their products. Congratulation! You have made it 70% of the article. You are almost there. Keep going! Biotin shampoo for hair loss – How long to see results? It’s worth noting that biotin isn’t a miraculous treatment that works over night. When it comes to hair loss, no solution can address the bald patches and thinning areas in a matter of days. See, the average hair growth rate for Caucasians is approximately 5 inches per year, which translates to about 0.42 inches per month. Asians showed a slightly faster average hair growth rate, at 0.5 inches per month. Taking the average rate into account, it’s clear that any results from your biotin hair growth shampoo won’t be easily noticeable — at least not in a few days or couple of weeks. It’s also important to remember that they type of hair loss in play can affect how quickly the results become visible. Telogen effluvium, for example, can be temporary. A physical or emotional stressor can cause hair follicles to prematurely move to the telogen phase, leading to excessive hair fall. The right biotin shampoo will strengthen and nourish your hair follicles so they can go back to effectively producing hair strands. Because biotin can prevent brittleness and breakage, you can see hair regrowth in a minimum of two to three weeks. If the cause of hair loss is androgenetic alopecia, however, hair regrowth can take a bit more time. This is because biotin’s primary role in this case is to prevent further damage to the existing hair. Want to boost the effects of your biotin shampoo? You can always up your biotin intake through your diet! Meat also has biotin, but 3 ounces of beef liver can provide 30 micrograms of this B vitamin, while the same amount of pork chop only yields 4 micrograms. Salmon and avocado are excellent options as well. Both contain not just biotin, but also healthy fats and nutrients beneficial to the skin and hair, like omega-3 and vitamin E.
Don’t forget eggs — one cooked egg can give you 10 micrograms of biotin. Just eat one for breakfast daily and you are set. Of course, there are other options if you’re not into meat or animal by-products in general. Nuts and legumes are also rich in biotin, so load up on almonds, edamame, or black-eyed peas to get your fix. Sweet potatoes and cauliflower are low in calorie but high in biotin, so add these to your diet if you’re looking to nourish your hair without expanding your waist line. Just one cup of cauliflower can give you 4 micrograms of biotin, and at only 25 calories to boot. There’s no question that biotin is an excellent addition to your hair loss fighting arsenal. It’s a proven treatment that strengthens and nourishes the hair follicles. Biotin prevents breakage and stops hair from becoming brittle and weak. With biotin, your hair is stronger, longer, and less prone to split ends. For hair loss sufferers, the last thing you want is a shampoo that further weakens the hair you have. The shampoos you find at the drugstore or the grocery can exacerbate hair loss and increase the damage. By switching to a biotin shampoo, you can repair hair damage and protect your existing strands from further breakage. Biotin also increases hair volume, giving you noticeably thicker hair with regular use. Although biotin is not a miracle cure, it does perform dual functionality — protecting hair and encouraging regrowth at the same time. This makes it an excellent choice for combating thinning hair and excessive hair fall, whether caused by telogen effluvium, alopecia areata, or androgenetic alopecia. Even with these many choices, the best biotin shampoo for hair growth is the one you enjoy using.